Hanoi is perhaps the most graceful, atmospheric and exotic capital city in Asia. Its appeal is instant with sweeping boulevards, tree-fringed lake, ancient pagodas and a relative compact historic centre. This 1000 year cultural city has various interesting things waiting for you to explore and experience. Vietwind travel is pleasure to introduce you the traveling program discovering Hanoi “Hanoi Travel 2014 with Vietwindtravel”. Let us become a partner on your journey to explore this amazing and beautiful city. 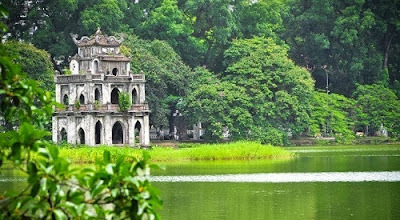 Hanoi encompasses thousands of interesting things derived from 1000 cultural years as well as its particular important role throughout the historical length of the country. 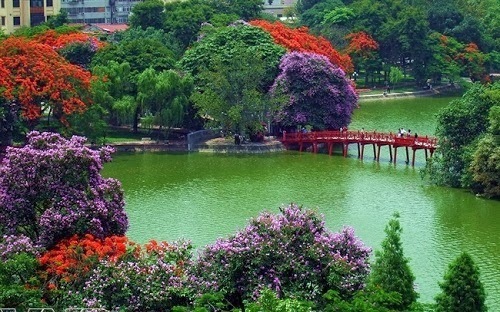 Because of this, you may take years to understand deeply and explore completely Hanoi. However with your busy schedule and limited time, let Vietwindtravel to become your organizer, your partner and your friend to have an authentic Hanoi tour which not just seeing, and watching, but experiencing Hanoi life, Hanoi landscape and understanding Hanoi culture and people. In effort to become the leading travel company in Vietnam, established by the members who had many year- experiences in tourism, Vietwindtravel always try to provide the most exciting and convenient tours with the most affordable price. We are one of companies in Vietnam having experience and a credible reputation specializing in organizing Hanoi day tour and relating services including hotel reservation, air and train ticket booking, transportation, tour guide, and travel consultancy… In 2014, we offer the travel program “.Hanoi Travel 2014 with Vietwindtravel” with various choices one of which certainly meets your expectation. The tours will take you to visit the most interesting and beautiful places in Hanoi and its surroundings for sightseeing the stunning landscapes, explore the exotic culture, and enjoy the absolutely fresh and delicious Hanoi’s specialties. Besides, you also have the chance to visit the ancient villages and Traditional Handicraft Villages nearby Hanoi. You certainly admire the skillful craftsman and the sophisticated objects, and if you are interested, the professional craftsman will be ready to guide you to make the small beautiful gift by yourself for your family and friends. Let Vietwindtravel introduce briefly about our traveling program “Hanoi Travel 2014 with Vietwindtravel”. 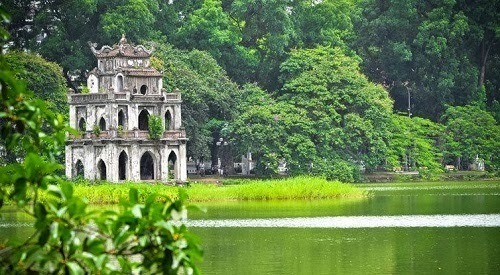 This tour will take you aroud Hanoi to visit the most famous places including including Ho Chi Minh’s Mausoleum –Ho Chi Minh’s stilt house – where president Ho Chi Ho lived on and off from 1958 to 1969, and Ho Chi Minh’s museum where restore the objects and a lot of information about President Ho Chi Minh. Around the corner from the mausoleum is the unique One Pillar pagoda ( Chua Mot Cot). Built in 1049 under Ly dynasty, this beautiful wooden pagoda rest on a single stone pillar rising out of lotus pool. Legend has it that in a dream King Ly Thai To saw the goddess Quan Am seated on a lotus leaf offering him a male child in her outstretched arms. The King is said to have built the pagoda as a sign of his gratitude. Leave One Pillar Pagoda for the Temple of Literature the first college of Viet Nam dedicated to Confucian. In the afternoon, visitor will visit Tran Quoc pagoda on the tiny peninsula of the West lake, one vietnam’s most ancient pagodas built in 1639. 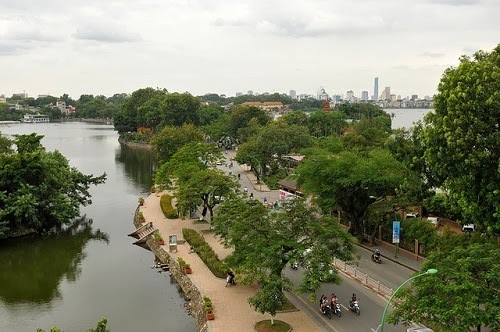 The last place of city tour is Hoan Kiem Lake (Restored Sword Lake) in the centre Hanoi and visit Ngoc Son Temple which sits pretty on a delightful little island in the Northern part of Hoan Kiem Lake. Click Here to see more about Hanoi. Leaving Hanoi and its populous suburbs, you enter the picturesque provincial regions with their chequer-board patterned paddy fields. Green belts of trees and bamboo enclose villages where traditional communal houses, pagodas and temples remain hidden from view beyond the roadside fields. The tour will take you to visit Duong Lam- an Ancient Village with the particular characteristics of wet rice civilization of the North Vietnam which has a history of about 1,200 years with many houses dating back up to 400 years and well-known for its surviving literate brick houses, built three to four centuries ago. Literate is red clay formed from weathered basalt found in northern Vietnam. It is also famous nationwide as “the hometown of two kings”. Located east of Ninh Binh province where is considered as “ Halong Bay in land”and covering almost 2000 hectares, Trang An eco-tourism complex is divided into 5 main sections: specially preserved area – ancient citadel of Hoa Lu, a central area, a natural area of grottoes and caves, a tourist service area, a holy mountain of Bai Dinh Pagoda area. With hundreds of big and small statutes, numerous categories of architectural works, Bai Dinh Pagoda is now one of the biggest in Vietnam and in South East Asia as well. With the total 47 historical vestiges, hidden caves and grottoes in limestone karst, valleys, rivers and streams all together create a fanciful landscape, Trang An is a wonderful destination for those who want to leave behind the busy and populous suburbs. This place allows you to sit on a small boat with 6 people, go around the river, visit the caves, enjoy the cool weather the Trang An Grottoes Eco-tourism Complex consists of limestone mountain ranges, valleys and rivers which blend harmoniously together in a wash of green. All these factors make a fanciful and romantic atmosphere. Perfume Pagoda is 75 kms southward of Ha Noi. This is the biggest complex pagoda , where hosts the longest festival in Viet Nam (from the first month to the third one base on the lunar calendar). Moreover, Perfume Pagoda is knows a place which has spectacular landscape, you will have chance to enjoy the marvelous sceneries combined between mountains and streams when you get there. If you really fancy your day work-out, you can row the boat by yourself. The entertaining boat trip along the scenic waterways between limestones cliffs take about 2 hours return, allow a couple more hours to climb to the top and return. The path to the summit is steep in places. However, the good news is that there is now a cable car to the summit. The area of Hoa Lu- the ancient capital of Vietnam and Tam Coc, often referred to as “Ha Long Bay inland”, is characterized by blue green river curving around limestone formations, and covered with brilliant green rice fields that make this picturesque area so unique. 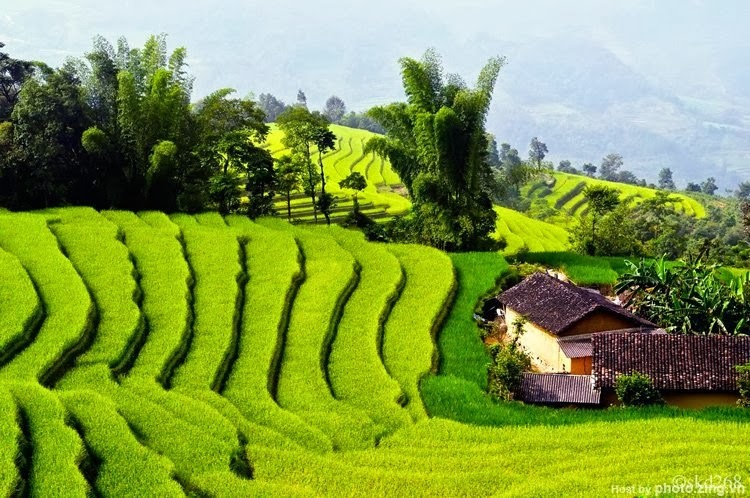 Those who love to explore real countryside images of Vietnam can proceed a 40 minute cycling ride along country lane (from Tam Coc to Bich Dong Pagoda, estimated time 40 minutes for 5km cycling 2 ways), experiencing the beautiful scenery of lush paddy fields. Our trip offers smooth combination of biking and row boating in this gorgeous scenery and pristine landscapes, special local food is also on your menu lunch. Numerous villages surrounding Hanoi specialize in cottage industries. Visiting these settlements can make a rewarding day trip. The tour will take you to visit Bat Trang ceramic village and Van Phuc silk village. Bat Trang, the seven-century old pottery village, is an interesting attraction in Hanoi that tourists should not ignore. Located in an area rich in clay, the village has advantage of ingredients to create fine ceramics. 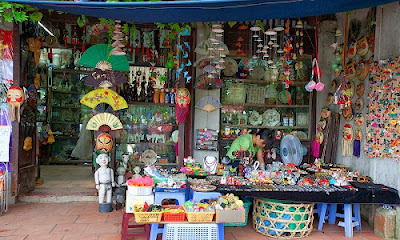 Visiting Bat Trang, tourists can take a walk or join a buffalo tour for sightseeing and shopping. Besides many ceramic stores along the road in the village, tourists should visit Bat Trang Porcelain and Pottery Market where they can directly make pottery products by themselves. Many youngsters and foreign tourists are interested in this pottery- making experience, and spend a whole day in the market to make a gift for family or friends. Van Phuc Silk Village is proud to be the origin of best silk and silk-making industry of Vietnam, which is attached to a long-lasting history of more than two thousand years. Though passing by lots of ups and downs, during the recent years, the village’s craft has enjoyed revival due to a surging demand for silk in both the domestic and foreign markets. . 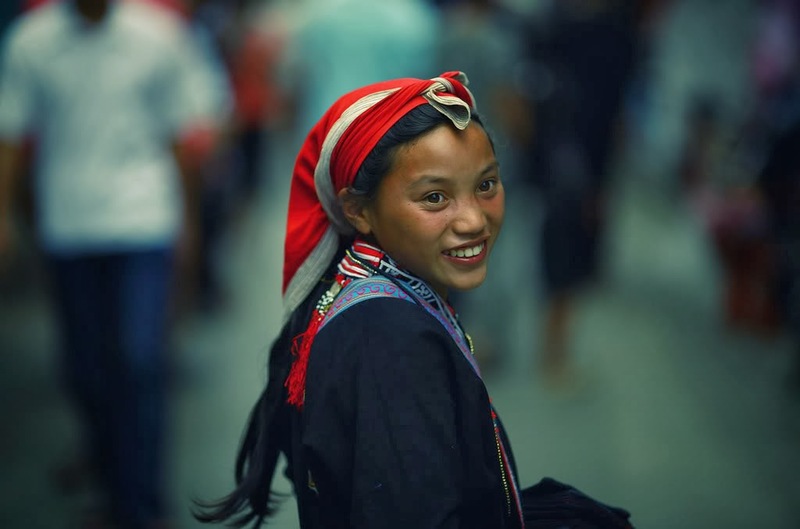 The local silk is known for its smooth and lightweight appearance, many families in Van Phuc open their own shops on the main road of the village; create a “town of silk” that sell eye-catching and high quality silk products. Tourists may buy available nice souvenir and clothes in the shop, or select the most suitable materials to then get customized products. 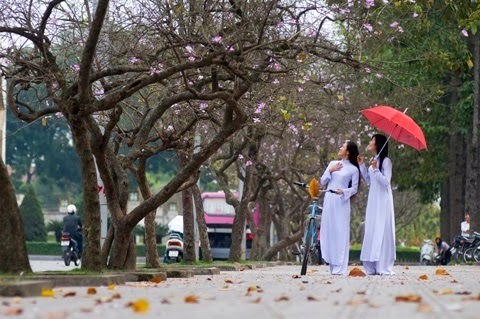 Hanoi was listed in the top 10 walking tours for globetrotting foodies by lonelyplanet.com in April. It’s really a heaven for foodies. Hanoi is renowned for its street food, with some calling it the best in Vietnam, and potentially even in Asia. There are street food vendors all over the city, with a large concentration in the Old Quarter and around Hoan Kiem Lake. 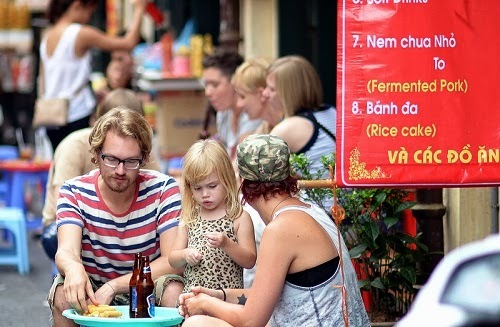 The tour will take you to visit 36 streets of Hanoi to enjoy the delicious Hannoi specialties with famous dishes like La Vong grilled fish pie, Pho ( Vietnamese noodle), roll cake ( banh cuon), Bun thang… After lunch, enjoy a walking tour through the old quarter for a better knowing of the town, do some shopping, take photos, also enjoy Hanoi Coffee with condensed milk at a top roof Café old quarter of Hanoi. Later this afternoon, enjoy a water puppet show at the Thang Long water puppet theater. Then stroll around the lake. If you are interested in Hanoi antique or Fine Art, we can plan to visit a couple of Galleries and talk to a famous artist. Everything from firecrackers to silk paintings; woodcarvings to ceramics and puppets to pottery are made in these locations and can make unique gifts for friends and family at home. Dong Ho traditional paper village and Dong Ki wood village will be the destinations in this trip. The Dong Ho village, a craft village located on the left bank of the Đuống River in Bắc Ninh Province, about 35 km from Hanoi which is well-known for Dong Ho painting. Dong Ho painting is considered a fine reflection of the traditional aesthetic value, social philosophies and humanitarian desires as spring approaches. The traditional themes of Dong Ho painting are good luck signs, historical figures, folk allegories, popular stories and social commentary. .
Dong Ky was once known as the village of firecracker, where local households lived by producing firecrackers. After government's prohibition of firecrackers, the village residents changed to producing wood furniture. You will be surprised at the quality and sophistication of each masterpiece. Visiting Dong Ki village, you can watch carpenters forming, carving and polishing wood products, making decorated pictures by snail, oyster shells. If you wish, you can have handcrafted furniture custom-made here and exported directly to your address abroad. 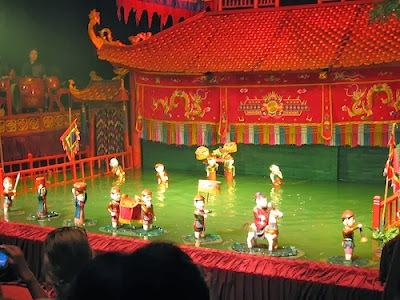 After that, you will return to the city for the water puppet performance - long traditional cultural activity of agriculture-based citizens by the Red River in Northern Vietnam and has existed for a long time with unique features.